Wassall, Rebecca R. / Preshaw, Philip M.
It has long been recognised that patients with type 2 diabetes mellitus (T2DM) tend to suffer from advanced forms of periodontal disease, particularly if they have poor glycaemic control. Many studies have reported T2DM to be a risk factor for periodontitis, with diabetic populations demonstrating increased gingival inflammation, probing depths, attachment loss and alveolar bone destruction compared with non-diabetic controls. T2DM is increasingly viewed as an inflammatory condition, and dysregulated immune-inflammatory responses in patients with T2DM may increase susceptibility to periodontal disease by disrupting local cytokine networks in the periodontium. Cytokines such as interleukin-6 (IL-6) and tumour necrosis factor-α (TNF-α) play a role in the pathogenesis of both diseases, and together with other mediators such as the IL-1 family of cytokines and adipokines may, in part, provide a mechanistic link between T2DM and periodontitis. Altered neutrophil function and deposition of advanced glycation endproducts (AGEs) are also likely to play key roles in increasing susceptibility to periodontitis in patients with T2DM. Emerging data have recently suggested that periodontal treatment may have a favourable impact on glycaemic control. Such findings, if confirmed, would present opportunities for the dental team to become increasingly involved in the general management of patients with both periodontal disease and T2DM. This article provides a brief outline of the suture materials used in periodontal surgery and their properties. Success of surgical treatment depends on achieving primary wound healing, particularly with demanding surgical techniques - especially in relation to regenerative methods. Choosing the right material in combination with the appropriate technique is the cornerstone of treatment success. Patanwala, Alifya / Chapple, Iain L. C.
Cowden syndrome, also known as multiple hamartoma and neoplasia syndrome or PTEN (phosphatase tensin homologue) hamartoma syndrome, was first described in 1963. Cowden syndrome has a genetic basis in a novel mutation in the transforming growth factor (TGF)-regulated and epithelial cell-enriched phosphatase (PTEN) tumour suppressor gene located on 10q23.3. It characteristically gives rise to lesions from all three germ layers (ectoderm, endoderm and mesoderm), which commonly affect the skin, mucous membranes, breasts, gastrointestinal tract and thyroid gland. Certain lesions have been shown to undergo malignant change, e.g. adenocarcinomas may arise in the breasts, thyroid and gastrointestinal tract. Other associated conditions such as macrocephaly and kyphoscoliosis have also been reported. The reported case is of a 22-year-old female who presented with gingival overgrowth/hyperplasia. Her medical history revealed that she had previously had a follicular adenoma of the thyroid, angiolipomas affecting the leg and forearm and hydrocephalus as a child. The patient underwent routine hygiene phase therapy for her periodontal condition, and later also underwent gingivectomy. The patient has only recently been diagnosed with Cowden syndrome, which highlights the importance of recognising how apparently unrelated medical conditions may form pieces in the jigsaw puzzles that underpin rare syndromes, and which include oral lesions as manifestations of those syndromes. Long-term review of the oral cavity will be essential in this patient, to monitor potential oral tumour development. This clinical case report presents a single-unit replacement of a central incisor following periodontitis. Criteria concerning tissue management are presented in order to better manage aesthetic issues posed in anterior implantation in the maxilla. 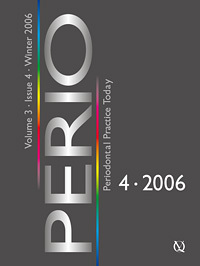 Aggressive periodontitis (AP) is a distinct type of periodontitis previously termed early-onset periodontitis (EOP). Risk factors of AP are numerous but have not been studied in Jordanian adults. The aims of this study were to investigate the relationship between a number of risk indicators and AP, and to compare risk indicators of aggressive and chronic periodontitis (CP). The sample consisted of 195 patients (109 AP and 86 CP patients) attending Jordan University of Science and Technology (JUST) Dental Teaching Centre. Approximately 75% of subjects with AP were females and 25% were males. The majority of AP patients were >=35 years of age, not working, had a family income <625 Euro/month (<500 JD/month), lived in rural areas, and had completed secondary education only. There was a statistically significant difference (p <0.05) between AP and CP patients with regard to age, frequency and duration of brushing, and to type, quantity and duration of smoking. Approximately 61% of AP patients reported presence of periodontal problems among other family members and approximately 41% of them had consanguineous parents, but these were not statistically significant when compared with the CP group. The percentages of mean clinical attachment level (CAL) >3mm, mean CAL >5mm, and mean pocket probing depth were statistically different between AP and CP groups. We conclude that young age, not smoking, reduced oral hygiene measures, income <625 Euro/month, urban residency and regular attendance to dental/periodontal clinics are associated with increasing risk of AP. However, it appears that the impact of these environmental risk factors is less in AP than in CP. Introduction: Reconstruction methods are an essential prerequisite for functional rehabilitation of the stomatognathic system. Platelet-rich plasma (PRP) offers a new and potentially useful adjunct to bone substitute materials in oral and maxillofacial reconstructive surgery. This animal study investigated the influence of PRP on the regeneration of bony defects, treated with deproteinized bovine bone mineral (DBBM). Materials and Methods: Twenty New Zealand white rabbits were included in this randomised, blinded study. Three equal 3 x 6 mm cranial bone defects were created and immediately grafted with DBBM, PRP + DBBM, or no treatment as control. The defects were evaluated with histological and histomorphometric analysis performed at 2, 4, 8 and 12 weeks. Results: The results showed a significant increase in histomorphometric bone area and trabecular maturity in both DBBM and DBBM + PRP samples as compared with the control after 4, 8 and 12 weeks. A significant increase in bone formation was seen with the addition of PRP to DBBM after 2, 4 and 8 weeks. At 12 weeks, the level of bone formation had adjusted similarly between the two groups. There was also a significant increase in the rate of biodegradation of DBBM particles after the addition of PRP throughout the study period. Neither foreign body reaction nor severe inflammation was seen in any of the specimens evaluated. Conclusions: Under the limitations of this study, PRP added additional benefits when DBBM was used in rabbit cranial defects concerning the speed of bone regeneration and the rate of biomaterial degradation.